When I was researching restaurants in the Fisherman's Wharf and Embarcadero areas, one caught my eye: Hillstone. It took me a while to figure out why it seemed so familiar. Then I remembered: Hillstone Restaurant Group was written about by Andrew Knowlton in the March 2016 issue of Bon Appetit. The San Francisco Hillstone is, for us, conveniently located across from Alcatraz Landing. We spent Saturday touring Alcatraz then went to the Ferry Building Marketplace. The restaurant is about the halfway point on the walk from the Ferry Building back to our hotel. We made 7 pm reservations to give us enough time at Alcatraz and the Ferry Building, but by 5~5:30 we found ourselves finished with our tourist activities and walking past the restaurant. It did not yet look crowded, so we stopped in to see if they could takes us earlier. Happily, they could. So we settled in at a dimly lit table, relieved to be out of the sunshine and in the a/c, away from the breeze and taking a break in the cool, comfy restaurant. Since we were thirsty from walking around all day and since we planned to have Irish coffee(s) later that evening, we didn't order alcoholic beverages. Just delicious iced teas. 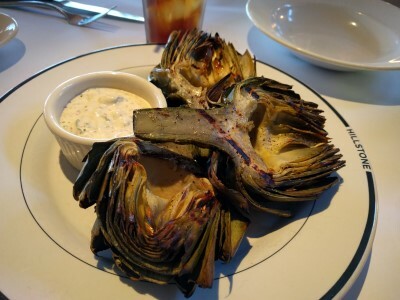 SP convinced me to try something I'd never before tried: Grilled Artichokes. These were true Red Label heirloom artichokes from Castroville, California, grown from root stock passed down by Italian immigrants (that's what the menu said!). Eating artichokes like this is definitely more work than eating artichoke hearts like I usually do. There was an amazing grilled flavor and the dipping sauce, a mustardy sauce, was so good I could have eaten it with a spoon. It took us a while to pull apart and eat the leaves. For my meal, I selected Free-Range Rotisserie Chicken - slow-roasted with crushed herbs, apricot glaze and tabbouleh. The skin on the chicken was so deliciously crispy and apricot flavored. The chicken was very tender. It was very easy to pull the meat from the bones. I enjoyed the tabbouleh a lot, too, even though I had to pick out tiny pieces of onion (I try to avoid onion, too, but it doesn't bother my stomach like garlic does). 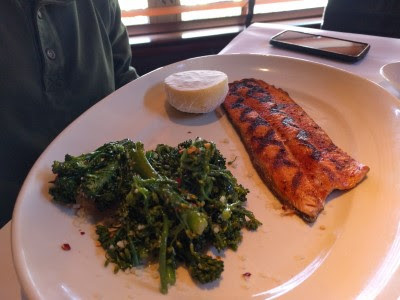 SP opted for Cajun Red Trout - seasoned and hardwood grilled, served with something green. Simple, but tasty. He helped me finish my chicken & tabbouleh, too. Since we had enjoyed a substantial breakfast and then snacked our way through the Ferry Building Marketplace and it was a bit early for dinner, we were stuffed after our artichokes and entrees, so we didn't have dessert. 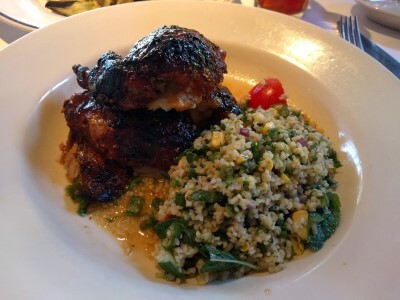 Overall, I really liked our food at Hillstone. Our food arrived a little quickly, which was surprising, but once they saw we were still pulling apart the artichokes, they took it back to the kitchen. We were a little worried about how our food would taste after sitting prepared for so long, but it was fine. Our server was great and checked on garlic for me. The other staff were friendly, too. Definitely a place we'd return.